You are a person, not a performance or platform. You’re a name, not a number. No matter what happens (or doesn’t), you are His. God isn’t too concerned about how much money you make each month or whether you landed your dream job. I doubt He’s paying much attention to your Twitter follower count or how many people liked your last Instagram post. I’ve been convicted lately, reminded that the only place I can truly find my worth and place my identity is in the One who gave me a name — His. Because it’s in that name that I receive my worth and identity. The naming came first, which therefore eliminates the striving. If He measures the waters in the hollow of His hand (Isaiah 40:12), why do I run around thinking the weight of the world rests on my shoulders? I can slow down and be still. I can release what was never mine to carry. The I Am says that I am already fully known and fully loved, chosen and free, redeemed and named. Sometimes I look to numbers to find my worth, as if reaching X number of followers or receiving X number of likes on a post could make Him love me more, increase my worth in His eyes. It’s so backwards, all this striving to receive something that has already been given and secured, something that can’t be taken away. He made a way; He offered His name and called me His own. 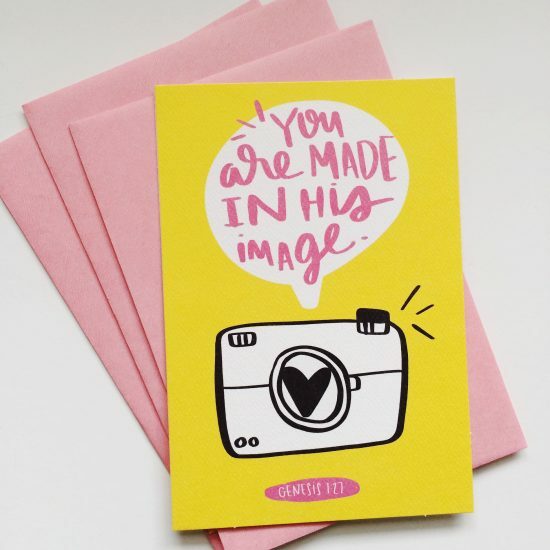 It’s the Creator who gets to declare the worth of His creation (not Instagram or Twitter or monthly income or the scale or a job title or Facebook or book reviews). Numbers are black and white but names are attached to a people, to a beating heart. We are His, children of the great I Am. We can stop striving; we’re already secure. We can stop rushing, franticly filling up to-do lists and checking things off; He’s already paid the price. We can start resting, trusting that the world is in His hands (not on our shoulders) and our identity, who we are, is found in Whose we are. He has called you by name, not by your social media handle. You are not a number; you have been named. What we call things matters and there’s often more to a name than we realize. 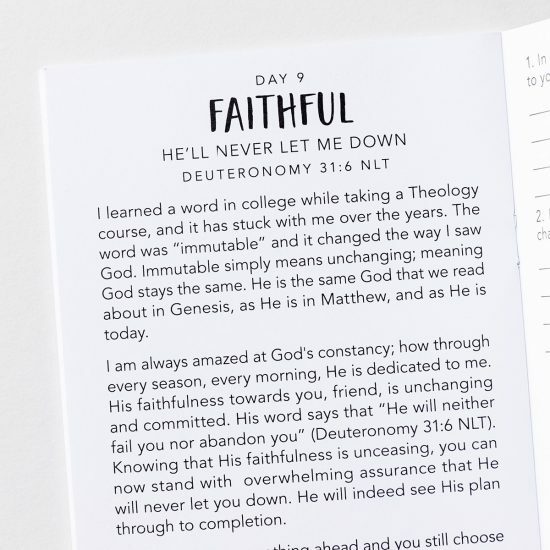 Just over a year ago I returned from Israel and immediately started reading through Deuteronomy with one request voiced: Jesus, show me more of Yourself. 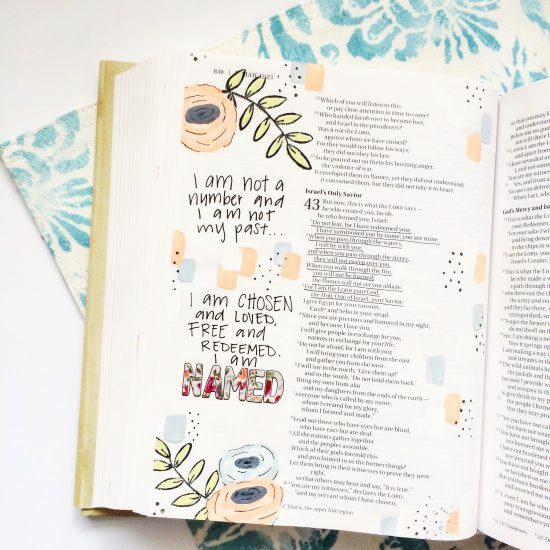 For months I’ve watched women create stunning Bible journaling artwork using DaySpring kits and paint, but I’ve been too intimidated to attempt painting in my Bible. I finally gave it a shot last week (all you need is a DaySpring kit, acrylic paint, and this clear mat so nothing bleeds through) and honestly, it’s so much easier than I thought! 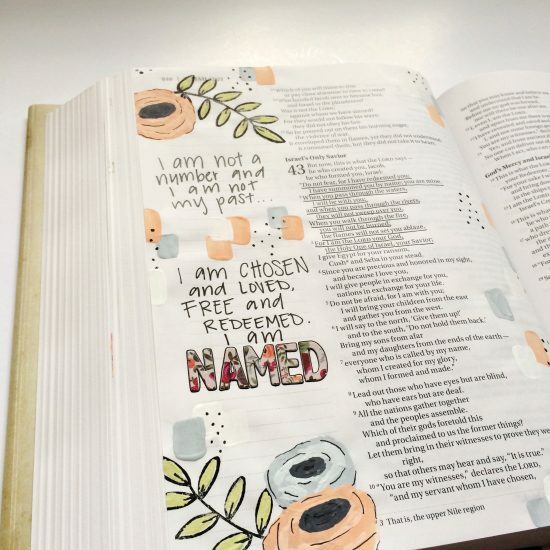 Painting isn’t my gifting (obviously…) but I really enjoyed spending time thinking about the underlined verses while working on the page. 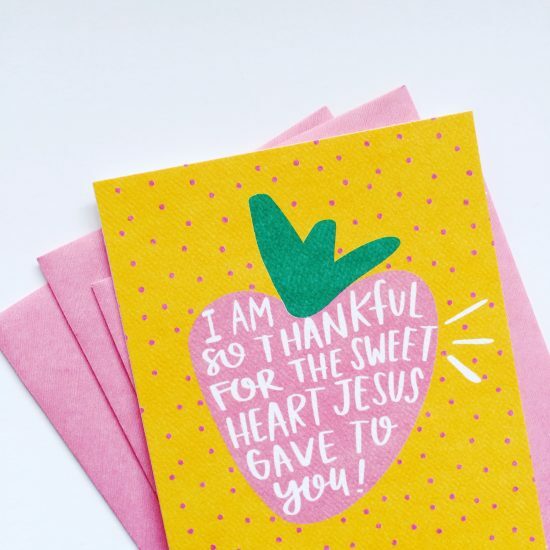 One last thing: Since many of you stumbled onto this little corner of the Internet through Five Minute Friday Snail Mail (way back when I created that whole shindig), I’d be remiss not to mention the fun and whimsical new line of Shanna Noel cards at DaySpring. I received these three cute ones to share with friends, but next time I place a DaySpring order (which is once a month, who are we kidding?) 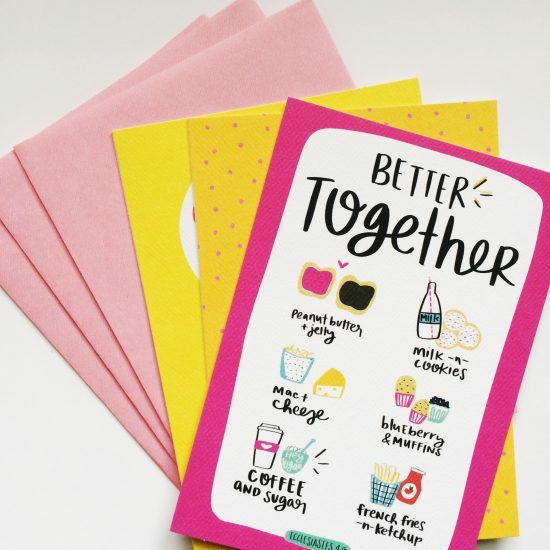 it’s a safe bet this “more coffee” card will find it’s way into my shopping cart. 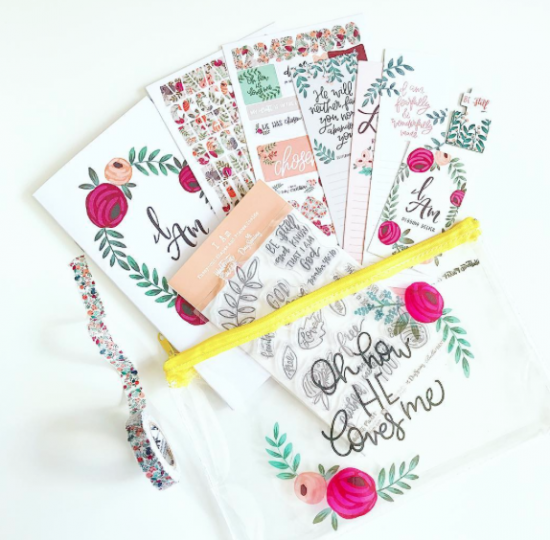 The gorgeous image of the I Am kit was taken by Lindsey Lanning. Affiliate links have been used in this post. Thank you for this, Kaitlyn! My before and after pulse (I’m a bit tightly wound tonight) should testify to how much peace it gives me tonight to be reminded of how my worth is not even relative. It’s entirely singular to God, and seen and counted in the only count that actually matters. Amen! I’m so glad to hear that, Lynne. Your comment was an encouragement to me today. Our worth is something so great, we can’t even fathom it. I know I need to lay off the numbers! Thanks for visiting, Niki! Gotta love H*W.
Thanks for the reminder, Kaitlyn, that God created, named, and chose each of us. At the end of last year I deleted all of my social media accounts and recently I have been thinking about whether or not I should make new accounts to better “promote” or share my blog with others… This post has helped me to see that if I am meant to make those accounts it will be clear when it is time, but that God doesn’t need social media. My blog will reach and grow in it’s time. (It is fun to see how God has used it already!) Thank you for the gentle reminder today that it isn’t about the quantity of readers or “likes” but the quality the message and the heart behind it. I pray your day is blessed! 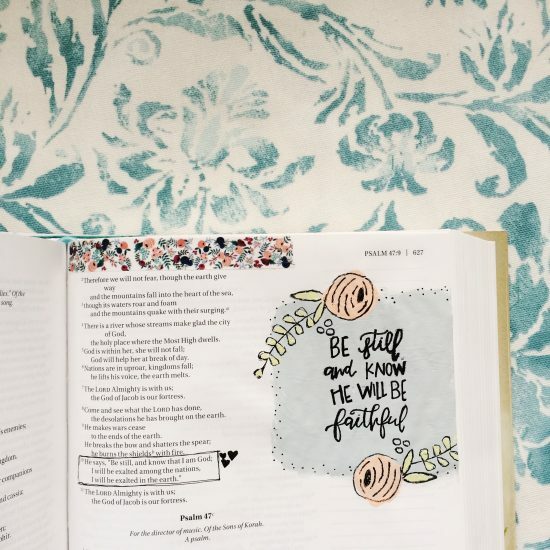 Great reminder of who we are in Him, Kaitlyn. And a truly beautiful kit! Thanks for sharing!